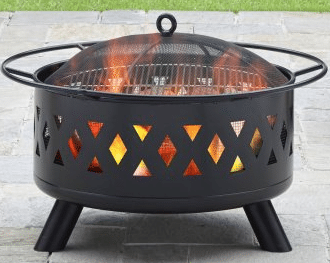 When looking for something to keep you warm when using your outdoor space during the cooler months, this heavy metal fire pit from Walmart.com will work well. The addition of a cooking grate will allow you to cook some of your favorite foods while sitting around a fire while enjoying your favorite adult beverage. The heavy duty fire pit will give you years of service due to its black powder coated finish and a poly cover to use when stored. Now lets look at some of the details of this fire pit. You get a heavy duty powder coated steel round fire bowl that is 24 inches across and 10 inches deep. 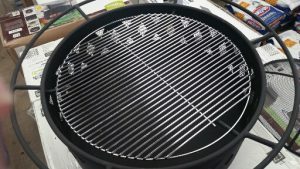 With the ring around the bowl it is 28 inches across, the ring will allow you to move your fire pit with proper protection while it is still hot. The bowl will be supported with four tube type legs that are welded on. Four welded on supports will let you install the grilling grate to cook your favorite meal. The fire pit will be 14 inches high without spark lid or 19 inches tall with spark lid. You will get a tool to lift the spark lid off and stir the fire, a poly cover to protect your fire pit during storage. The total weight of the fire pit is about 50 pounds. 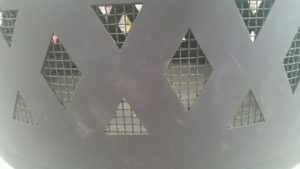 The lattice design on the sides has a screen inside to keep the embers from coming out the sides. The open lattice provides a better air flow for better wood burning. You can also get a view of the wood burning with out getting real close to the fire. The only assembly on this item is getting it out of the box. The legs are welded on so you do not have to worry about them falling off. After every thing is out of the box just put the wood inside and start your first fire. Insert grilling grate for cooking Hamburgers or Brats. If you are planning on using on a wooden or composite surface, look at the DeckProtect system for a solution here. Make sure you keep at least 10 feet from vinyl siding or other items that can be damaged from the heat of the fire. 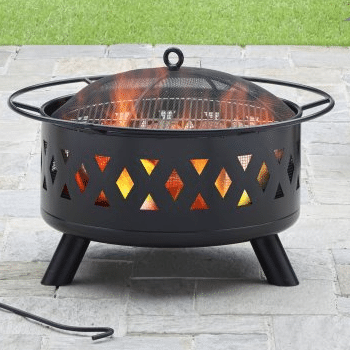 When looking for that heavy metal fire pit for your outdoor space, this heavy duty one from Walmart.com will do double duty with the cooking grate. The open sides will let you have that open fire feeling. If you think you need more choices see my other post on wood burning fire pits and gas fire pits. Thanks for reading my article, if you have any questions, comments or items that you would like more information about, use the forms below. Don't forget to let your friends know about this article and share on your social networks. This fire pit looks really good with the stylistic “holes” around it. The burning fire inside will be exposed and makes the pit look beautiful. I’m assuming that the holes help with the overall cooking process as well? Correct me if I’m wrong here. Other than that, the price of this pit is affordable in my opinion, considering the available features. The holes help the fire breathe and give you a view of the flame from the side. I do not know if it will help with the cooking much as some of the heat from the fire will be lost through the holes in the side. Thanks for this review, John. I really like the look of this heavy metal fire pit. Simple yet solid and looks like it would be great fun to cook on. This will be a fire pit that you will find a place to pu and keep it there most of the cooler months. It will give you plenty of fires before it is finished. I’ve been thinking about a fire pit for my patio and this one looks really nice. Love the fact that it has a grill with it so you can always throw on something to eat without firing up the grill. And living here in windy Colorado the weight will keep it from blowing off the patio! This fire pit is the best for using like a campfire to keep warm. Get a little fire wood and you could spend all night around this fire pit.